All of us do it. Give into the temptation of a lazy Sunday afternoon, seduced by a hot meal and the promise of Champions League football or fatigue. That ‘I can’t be arsed’ feeling. I’ve been training, in one form or another since April 1981; you would think I would be passed that ‘can’t be arsed’ feeling by now. But I’m not. I see it with students as well. So many start with all the ambition in the world, but when the sun comes calling or the beer is cold, or even worse, if the weather is cold, that resolve starts to crumble. Or the partner who says ‘You’re not going training again, are you?’ We all allow life to get in the way. And when I ask where you’ve been, the most common excuse is that you haven’t had the time lately. You forget you are speaking to a master procrastinator. A skiver. A lazy bugger who loves to read or watch something good on the TV. You forget I know your demons. Or you think your demons are different to mine. They’re not. Does sitting at home, drinking beer and watching football help me improve? Does it make me fitter? Will it help me pass my grading? The answer is no. And the fact is that every workout, every class, every run is different. You never know what you will miss out on. What experience, that may shape your life, you won’t have. The key that may take you another three years to learn. A missed workout can never be replaced. You never know when that mood, moment or time will be able to be replicated. And because of this, because of this desire to improve, to learn and become a better ‘me’ I train. I plan my weekly workouts and I force myself to go out. I’m not 100% foolproof, but my desire keeps bringing me to the well. What will make sure you keep visiting too? Your fist slams into the bag with the sound of a man beating a bloody corpse with a stick. Again and again you try to build speed and ferocity as the heavy bag absorbs the best you have. It makes no judgement, it accepts all strikes and defies you to try harder. The fighter, the boxer, the mentally prepared, take heavy bag work seriously, although it takes everything you have it also gives back in invisible spades. Each strike saps your energy and yet manages to increase your power. 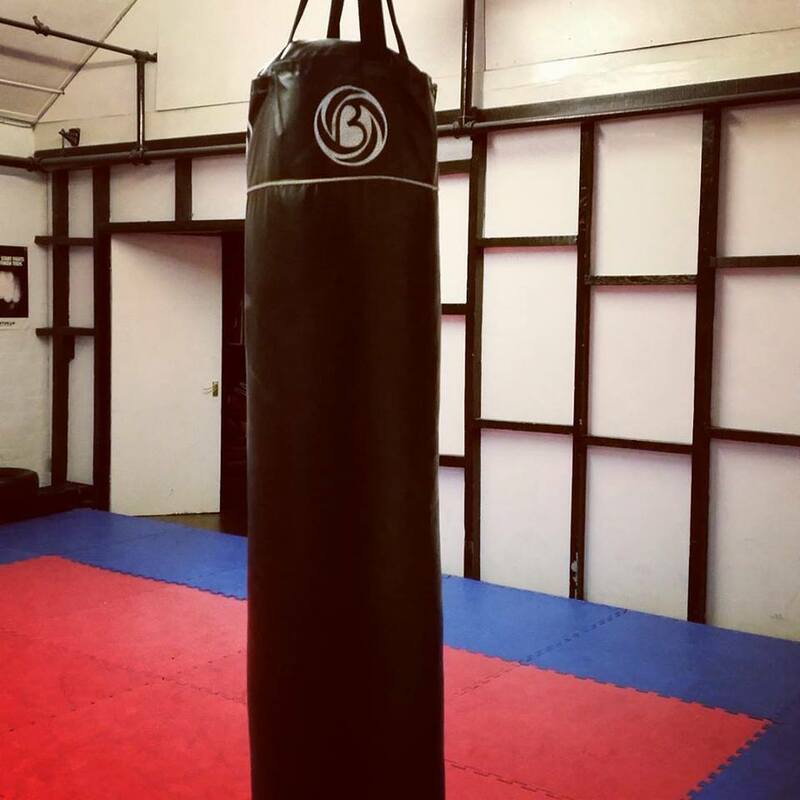 The top and bottom bag may frustrate the eye, but the heavy bag is where your visualisation, speed and power all come together. To stand in front of that bag without visualisation is to have only half a workout. You must see your opponent, imagine them crumpling under your punches, wincing in pain. As you smash the bag you can see the ribs breaking under your fists, like ‘Rocky’ attacking a side of beef and then Apollo Creed. Crack, snap and crack again. Body – head, head – body. Take the body and the head will fall; as boxers are taught to do. What of the head? The control centre, where all pain is registered and all ideas form. Rapidly the hook travels from the body to the jaw. You take a step to the left, just slightly, and the hand flies up from the body crashing into where the jaw would be. You can imagine your hand destroying the face like a baseball bat: spraying teeth and fracturing the jaw or you catch him higher up scrambling his brains and destroying the message to the brain that says ‘stand up’. In your mind his body collapses and you continue to strike; when the body no longer moves then you will stop. The seconds tick down and you move around the bag, seeing the opponent and looking for an opening. The jab whips out, rocking the head back. The cross is almost as fast, but harder, followed by two hooks, one to the body and the crashing blow to the head. Can you hit harder? Can you hit faster? Energy reserves are not important: this is all about doing the job; harder, faster, smash, crash, destroy. Your hands move in a rhythm and the bag sings the song of the victor. With speed, power and accuracy; you will not lose to someone who doesn’t train. The clock sounds the end of the two minute round. You rest for a minute and go again. Seeking greater imagination: remembering Tyson, Sonny Liston. Roberto Duran, two Sugar Ray’s and the king of them all: Muhammed Ali. Even Tyson admitted that Ali was a killer. A surgeon of the square ring, hacking, cutting and chopping men down. You strive to emulate them all, but how? Through hard work and good coaching, but most of all dedication and perspiration. You have to want the prize. Many claim to, but most pay only lip service to the task. A thousand promises collapse in one series of exercises and a quick, fast run. Without commitment you have nothing and inside you know it. You must try harder, you will never give up. The sound of the buzzer brings you back to the task at hand. One more round, sweat drips down your back and off your hair. And then it is over. All of you, given to the bag. Black and tall, arrogant, but silent. It views your efforts with scorn, but reminds you to pay it a visit again. You must improve every time. Stronger, harder, better, faster. You walk away, now calm. Your heart rate returns to normal and the aggression inside has gone. Now silent, peaceful, the black outside contrasting with the light inside, you strip your gloves off and take a towel to wipe yourself down. Just the sound of the gentle to and fro of the bag as the energy fades. The light goes off and inside a phrase comes to mind: the poetry of pain. The first quarter of 2015 has been an interesting one at UFS, the introduction of massive changes in the grappling part of the syllabus and a host of learning and re-learning. That will continue onwards into the future now, but a few weeks ago I began thinking about what the next changes would be. Having had some meetings with Gary Dawson, Stacy Coles and Mo Teague it became more and more obvious that the way we approach fitness needs a shake up and it is coming this month. The introduction of the fitness test will help all of you evaluate where you are in terms of fitness and in your state of health; or not,as the case may be. “How you do anything is how you do everything”. It sounds simple enough, doesn’t it? Until you think about how you do things. Some people are always late, some people are always early, some people are really messy and some people are very, very neat. Some people believe that they are only scatter-brained in some areas of their life, others that they are completely ordered in their life. What is the answer? Whatever works for you, except I would also add the caveat “Moderation in all things, except moderation”. You also have to consider the impact you have on other people and how they view you. It’s not quite so easy now is it? I would then add the question, what do you want? What are your goals? Your ambitions? What do you want from your martial arts? What do you want from life? From your relationships? Over the next three months (April to June) I will be working with you to help you achieve, or at the very least plan, where you want to go. I wouldn’t want you to be like so many people and drift through life, because they will be the one’s getting to middle age wondering where their life has gone. We will also be discussing strategy and tactics. How do you deal with a one on one attack at 7am as you walk to work? How do you cope with a knife attack? What do you do if 2 attackers jump you? Or it could also be life questions. How do you cope with life’s bumps in the road? I want you to bring your questions, your challenges, your desires and your ambitions. The next 90 days could change your life forever, if you want it to. Martial arts is so much more than just the physical side of training, but the physical side cannot be neglected. If you keep getting injured we will look at that, the same if you keep getting ill. Balance is the key, rest and diet are as important as physical training. If you have questions email me at andygibney@nobrain-nogain.com or message me on Facebook. It’s going to be an interesting three months. Sometimes no matter how hard you work you feel like you’re going round and round. Here’s an idea for changing direction. 100 years of remembering. Making the stories personal. 100 years of remembering. Making the stories personal..